Check out Part 1 of this review which talks about the white wines, mead (honey wine) and the fortified. 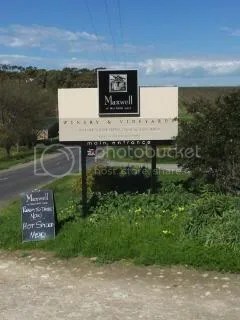 The Maxwell Cellar door facility is also available for functions (including weddings) and from 1st October they will be offering the Quartet, which is 4 courses of food matched with Maxwell wines. This will be offered on Friday to Sundays. The aromas and first flavors are your classic strawberries and cream. Then things go backwards. This is a sweet style with almost no flavor past the mid palate and the wine has almost no finish. What is there has some bitterness. A big pass for me. Here was some vegetative and blackcurrent characters that is so typical for Cabernet Sauvignon that also has the Merlot softness. The thing that was a little different was the soft tannin structure that seemed like black tea. This 75%/25% blend is a good easy drinking Cafe style drinking – share and enjoy. How interesting a Shiraz (82%), Grenache (13%) and Viognier (5%) blend. From my tastings around McLaren Vale so far I can only remember 1 other GSV blend. I also noted that the Shiraz & Viognier was co-fermented. On this basis alone I was looking forward to this. The aromas were some what closed (a new bottle was opened for me) but it did start to open up, showing some red fruits, with a few minutes letting it breath so I suspect one should decant the wine before drinking. The flavors were interesting – red fruits, blueberry, cardamon all with a touch of oak. I suspect there was maturation in large oak barrels. Bring on a nice gourmet pizza and pass this wine – thanks. If I had to describe this wine in one word it would be “juicy”. If I could use 2 words it would be “Juicy Plums”. If you like an up frount fruit driven wine then this would be one to try in the “good value” category. Full aromas and flavors of plum, blackberry, chocolate, mocha and earthy. I expect this wine to be a big “hit”. The juicy flavors would match well with a bowl of Spaghetti Bolognese toped with that wonderful Parmesan cheese. Maxwell wines is known for this wine so again I was looking forward to a wine made from the vines in front of the winery, that were planted in 1953 and the wine spent 24 months in oak. I call this typically McLaren Vale Shiraz – good plum fruit that links so well into the McLaren Vale mid palate with white pepper spice and vanilla from the American Oak. The overall effect provides a viscous and lengthy experience. 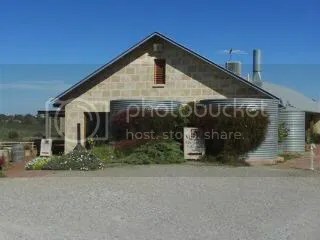 This wine is well priced for the quality when I compare it to others around McLaren Vale. I would like to see it a few more years in the bottle to show it’s best and then a big thick T Bone steak (vegies optional). The vines for this wine are behind the winery and were planted in 1972. The Lime Cave shows some special features of this site with a limestone cave being available for functions. Aromas of the Cabernet blackcurrent and smokey from the oak. The flavors are based around sweet blackcurrent fruit integrated with dried thyme that just creates a lengthy experience. This is an impressive Cabernet and would work well with Beef Wellington. This wine will be released on 1st November and I just happened to see an opened bottle sitting to one side of the cellar door tasting bench – and I talked my way into getting a taste. Here was strength – strength of plum fruit, of violets, vanilla and coffee. This is essence of McLaren Vale Shiraz and I felt all the better for trying it! Wonderful drinking now but I believe it will get better over quite a few years. Needs very strong foods like venison pie to work with the flavors of the wine.